1. Go to Outlook Express and open a NEW MAIL message. 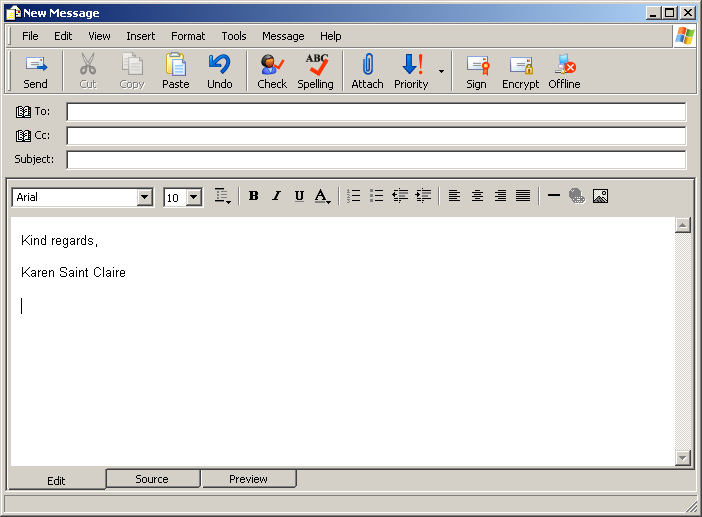 Make use it’s completely blank (remove any existing signature or stationery) and type in your standard closing block. Then position your cursor beneath your closing block. 3. Once everything is set just the way you want it, click FILE in the upper left corner of your window and select SAVE AS from the menu. 4. From your inbox, click TOOLS on the top menu and pull down to OPTIONS. Click on the SIGNATURES tab. 5. Click the button labeled NEW.